The ongoing mass extinction of the natural world ranks with pandemics, world war, and climate change as among the greatest threats that humanity has imposed on itself. To lose so much of Earth’s biodiversity is to both destroy our living heritage, and to risk the stability of the planet, today and for all future generations. 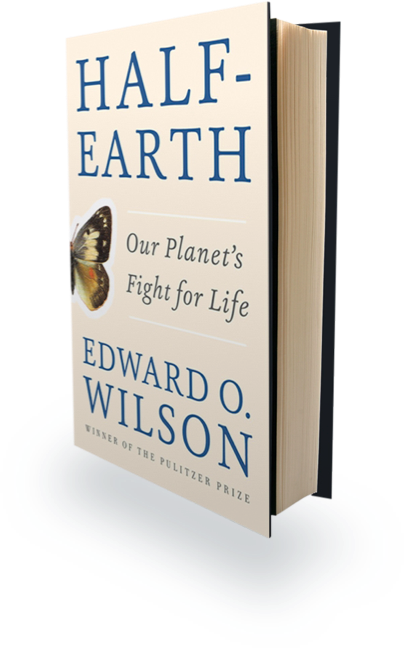 Half-Earth is a call to protect half the land and sea in order to manage sufficient habitat to reverse the species extinction crisis and ensure the long-term health of our planet. 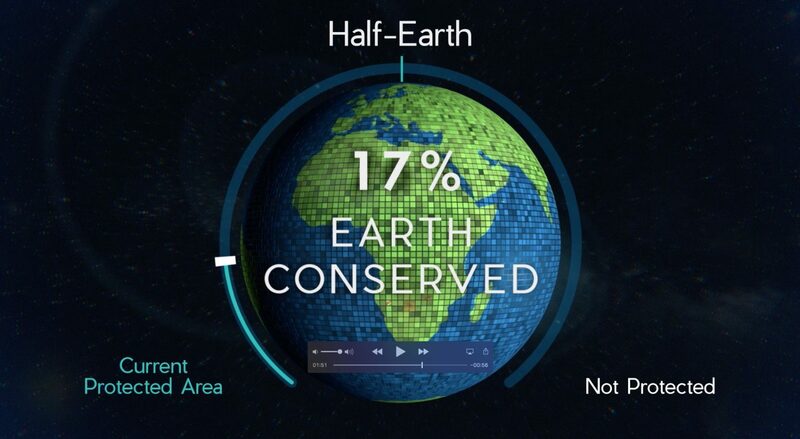 The Half-Earth Project is bringing this goal to life. Why one-half? The crucial factor in the life and death of species is the amount of suitable habitat left to them. As defined by the theory of island biogeography, a change in area of a habitat results in a change in the sustainable number of species by approximately the fourth root. As reserves grow in size, the diversity of life surviving within them also grows. As reserves are reduced in area, the diversity within them declines to a mathematically predictable degree swiftly – often immediately and, for a large fraction, forever. When 90% of habitat is removed, the number of species that can persist sustainably will descend to about a half. Such is the actual condition of many of the most species-rich localities around the world. 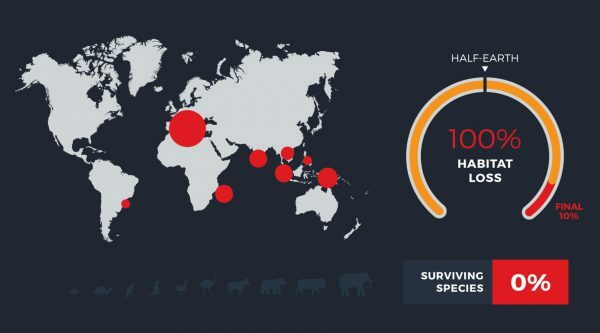 In these places, if 10% of the remaining natural habitat were then also removed, most or all of the surviving resident species would disappear. 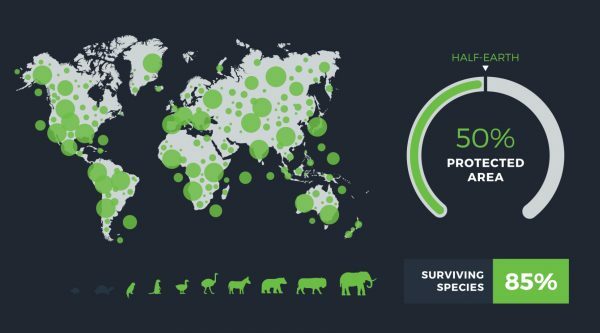 If, on the other hand, we protect half the global surface, the fraction of species protected will be 85%, or more. At one-half and above, life on Earth enters the safe zone. Half-Earth is a call to protect half the land and sea in order to manage sufficient habitat to safeguard the bulk of biodiversity. Advances in technology now allow us to comprehensively map the geospatial location and distribution of the species of our planet at high enough resolution to drive decision-making about where we have the best opportunity to protect the most species. This is the work of the Half-Earth Project. How do we make caring for the rest of life part of our common humanity and the way we live our lives? The Half-Earth Project is championing research to better understand our world, support conservation efforts, nurture future biodiversity stewardship, and perpetuate conservation efforts worldwide. We are working continuously to discover and identify our planet’s species and support regional biodiversity research and scholarship. 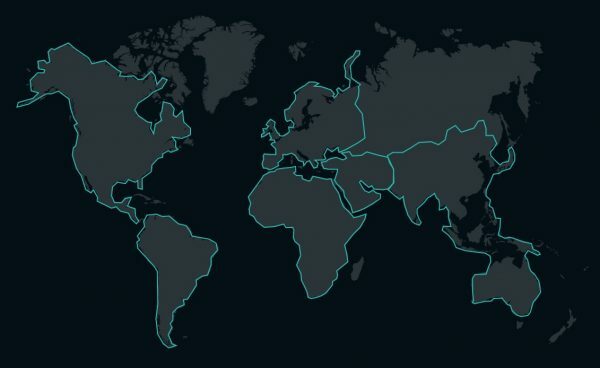 The Half-Earth Map is providing leadership to inform the identification of which places we can best manage for conservation in order to protect the most species. The Knowledge Platform is fostering greater understanding and action about how we can get to Half-Earth. Model conservation efforts are also showcased to inspire and inform best practices to get to Half-Earth. The Half-Earth Project is engaging people everywhere to join us and participate broadly to achieve the goal of Half-Earth. We are tracking progress towards the goal of Half-Earth as an inspiring moonshot we can all work together to reach. 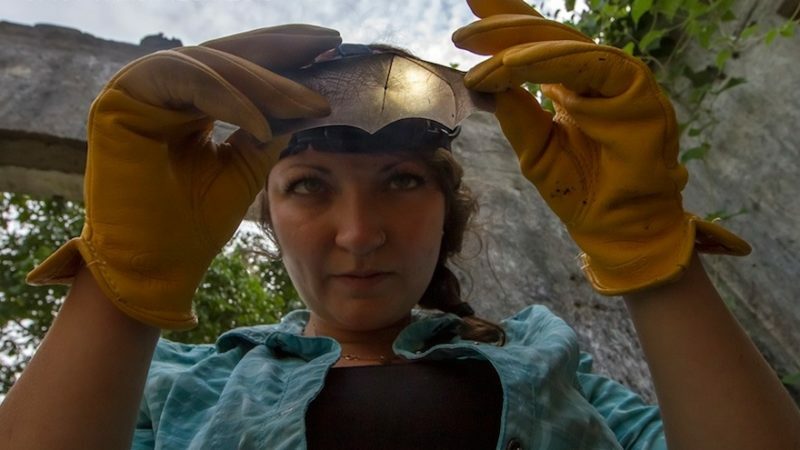 The Half-Earth Project Educator Ambassador program was created to provide a platform for teachers to engage each other and their students in the grand ambition of Half-Earth, and to inspire and connect students with the natural world. As part of the Educator Ambassador peer network, community members will have access to a rich set of educational resources, from compelling videos, to cutting-edge digital textbook content, to a state-of-the-art, data-rich interactive tool for mapping Earth’s biodiversity at high-resolution, and of course Ed Wilson’s own writings. With the grand ambition of Half-Earth as a moonshot, we’re counting on Half-Earth Project Educator Ambassadors to lead the way, guiding their students to be our next generation stewards. The Half-Earth Project is showcasing and supporting model conservation and species restoration efforts, using their inspiring stories to engage support and provide a model for similar conservation efforts throughout the world. Click on the logos to learn about the Half-Earth Project’s Model Conservation Effort organizations, including blogs and videos about their research efforts, their latest milestones, and their progress in leading the way to Half-Earth. The Half-Earth Chairs and Scholars program will champion biodiversity research and nurture scholarship that helps us understand our world and how to best care for it. This program will help create the next generation of conservation scientists, support local and regional biodiversity research, mentor scholars and next generation stewards, and provide regionally relevant expertise that perpetuates conservation efforts worldwide. Half-Earth Chairs are biodiversity researchers who have unique insight into the socio-economic needs and conservation priorities of their region. Based at universities in regions around the world, they provide a global footprint of scientific leadership for how we can best study, preserve and protect the biodiversity of our planet. Following their term, each Chair will become a permanent member of the Half-Earth Council. In order to seed and nurture next-generation science and stewardship worldwide, the Half-Earth Scholars program will support early career biodiversity research scientists. 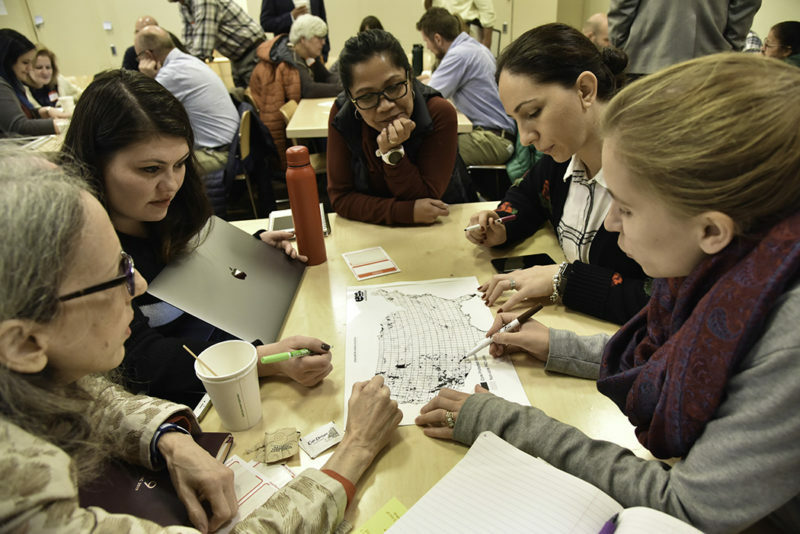 Scholars will be mentored by the Half-Earth Chairs and provided with the unique opportunity to engage with leading biodiversity researchers as they convene to support the goal of Half-Earth. Scholars will be selected from a global pool of qualified applicants. In order to reach a broad audience, the Half-Earth Project creates a transformative experience for a variety of audiences around the need to care for the rest of our planet, seeding a movement culture that supports the goal of Half-Earth. We will create and curate a dynamic online Knowledge Platform of maps, literature, white papers, policy papers, video and best practices that foster greater understanding and action to protect half the planet. Motivated by the species we are working to protect and the health of our shared planet, the Half-Earth Project team is a gathering of expertise from around the world necessary to achieving this grand goal. The Half-Earth Project is grateful to the leaders, advisors, partners and many other individuals and organizations who are part of this shared effort. The Half-Earth Council is composed of thought-leaders across the wide-ranging fields of expertise necessary to comprehensively address the extinction crisis and support a movement culture that works to protect half the Earth for the rest of life. The Half-Earth Council has scientific leadership at its core. Members of the Council include population, sustainability and restoration specialists; public and private conservation leaders; indigenous peoples advocates; biodiversity-minded economists; business engagement experts, creative media producers and celebrity icons.